Diego Jose Ramos with Louis Michael Concepcion and 8 others at PLDT TelTech Innolab, Dansalan, Mandaluyong. Team KASALI was declared one of the winners of the 2016 edition of the Hack the Climate Manila. Team KASALI is among the winners in the Hack The Climate Hackathon which is an ecological themed hackathon and the longest hackathon in the Philippines. This hackathon was the brainchild of two Princeton University students, juniors in the university at that time. 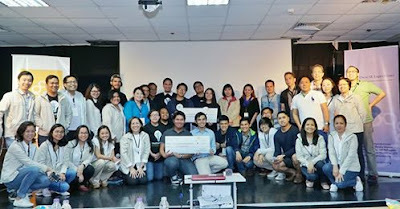 Having recived a grant from the Davis Projects for Peace, the two organized a hackathon in the Philippines that was considered “record breaking” not only in its length but for the concept of being of help in one of the most disaster prone and susceptible to climate change countries I the world. Realizing that climate change respects no boundaries, politics, race or creed, the development of solutions will hinge on the collaboration of diverse groups in an unprecedented way. The solutions that will be developed is the result of the coming together of computer programmers, environmental activists and other stakeholders. This will in turn come up with unique solutions that will have various disciplines and viewpoints as its source. Not only will apps be developed but what is more far ranging will be the strategic partnerships formed in the formulation, development and implementation of the solutions. The Top Prize of Php100,000 went to Project KA-SAMA while Team 220 got the runner up prize of Php50,000 with their app MedPrep.